The Honda GL1200SEI was more commonly known as the Honda Gold Wing 1200 Special Edition. You may be looking for the GL1200 "Plain", GL1200A Aspencade, GL1200I Interstate, or GL1200L Limited Edition. 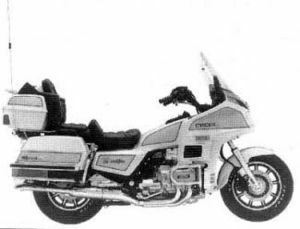 GL1200SE-i'86 - While the Limited Edition of 1985 was exclusive to that year, the Special Edition model was very similar to the "regular" Aspencade. It had a Dolby N.R. added to the stereo system. There was only one two-tone color: Pearl Splendor Ivory with Camel Beige Metallic. The frame serial number in California began 1HFSC1478GA200101 while in the rest of the U.S. it began 1HFSC1469GA200101. The engine serial number (for both California and the rest of the U.S.) began: SC14E-2610001. This page was last edited on 8 September 2010, at 11:53.